While the majority of the MMA-loving world were glued to their TV sets this past weekend to witness the miracle that went down at UFC 117, Fedor Emelianenko hosted a brief Q&A during the semi-finals of the “M-1 Selection: Americas Tournament” in Atlantic City, New Jersey. “For now, (we) M-1Global works with Strikeforce and we are concentrating on that. The contract is not over yet. 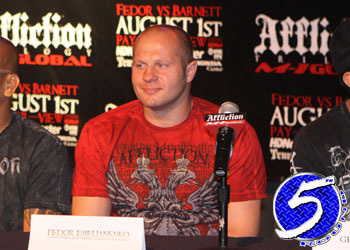 So for now, we don’t have any interest in the UFC,” Emelianenko matter-of-factly stated. The world’s former/current top heavyweight has one final bout remaining on his current Strikeforce deal, after which it’s expected he’ll ignite the biggest free agent frenzy since LeBron James opted to take his talents to South Beach. However, it appears both sides are working on an extension despite reports that M-1 and the San Jose, California based promotion haven’t been on the best of terms since Fedor’s abrupt exit from the land of The Unbeatables. “The relationship between ourselves, Strikeforce, and Showtime is a good one. We had a great event in June in San Jose and we look forward to more good events with our partners,” added M-1 Global director of operations Evgeni Kogan. “Smoothly” and “shortly?” I can’t think of many that have sat opposite the Russians at the negotiating table and would use those words to describe the arduous process of trying to ink the world’s most elusive heavyweight. While he’s notorious for his unprecedented levels of aloofness, the 33-year-old was quite specific when addressing how much longer he intends to compete in the violent world of mixed martial arts. Although the Team Fedor is claiming they aren’t interested in entering the Octagon, their tune might change if an extension isn’t reached by the time Fedor takes the cage again – which has been rumored for sometime this winter.